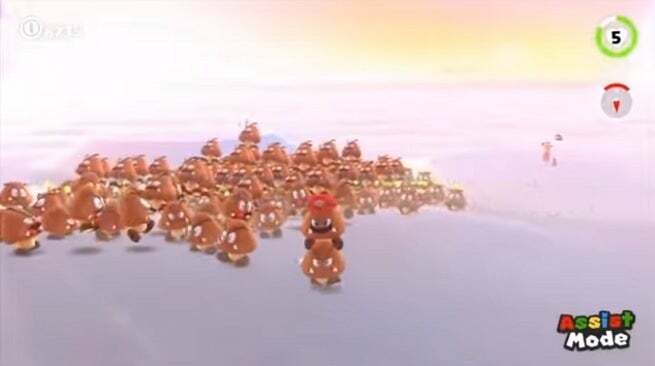 Super Mario Odyssey allows for 200 Goombas to be stacked on one another before crashing the Nintendo Switch, a fact that a player discovered in an experiment documented with a video. Skelux is the content creator responsible for the video above, a Nintendo Switch owner and Super Mario Odyssey player who finagled the game to allow for the massive Goomba stack to become a reality. Saying that the game’s Cloud Kingdom seemed a bit empty, they filled it with a towering stack of 200 Goombas. The number of Goombas shown in the video above does amount to 200, the video’s creator said, though it’s nearly impossible to tell that from the video alone seeing how the stack of Goombas doesn’t even fully fit within the camera’s frame. That amount of Goombas is also the most that the Nintendo Switch can handle with Skelux saying that any more Goombas added onto that results in the Nintendo Switch crashing due to the sheer volume of Goomba baddies stacked up on each other. After using Cappy to transform into a Goomba and see the stack from a different angle, we still can’t even see the full tower of Goombas due to its height with only the area around the halfway mark visible. It is possible to for the stack to fall over as well, the video demonstrated, with the taller stacks needing less wobble to knock them over and send all the Goombas tumbling down. Stacking the Goombas up once again, the player starts at the top with a ground-pound attack that plummets through the Goombas. Coin sounds ring as Goomba after Goomba is squashed, but it’s evident that the game isn’t really sure what to do with so many enemies being squashed at once. The stack shifts to the side and leaves many Goombas on the ground once the attack is completed despite showing the animation continuing all the way down the stack. Skelux has many more Super Mario Odyssey hacks and videos just like this one, some of which take pivotal characters out of the game’s equation, and they can all be seen through the creator’s YouTube channel.